The Arts have a long history in the Catholic Church as a means to bring Christ's teachings to the faithful. Icons, parables, music, dance, sculpture, painting, stained glass; then, radio,, motion pictures, recordings, television and the internet -- and now, the Spiritual Magic of Father Daniel. 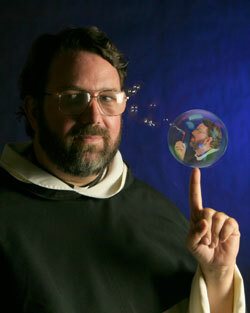 A Catholic priest with the Dominican Order of Preachers, Western Province, Father Daniel dramatizes his messages of faith and truth by deftly performing his life-long art of magic. He has integrated his "magical arts" into his ministry so seamlessly that he has won the applause and acclaim of the laity, fellow priests and the Catholic community wherever he has performed. Father Daniel also brings his persuasive "magic" to church fund-raising events and is particularly supportive of youth ministry projects. His instructive performances of "magical ministry" are enthusiastically received by both high school and college audiences.